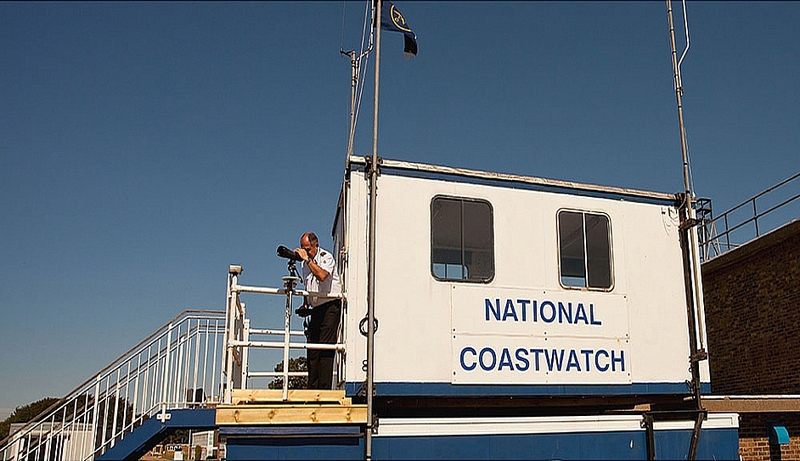 NCI locally maintains a dedicated watch-station at the end of Shoebury East Beach just inside the MOD site. You can see the watch station from the beach where we display information about the times of low and high water. Although situated at the far Eastern end of the Southend coastline, many people from throughout the borough use East Beach not to mention the many tourists who visit the town for its coastline and beaches. In addition, many of the small craft moored at Leigh and beyond, will travel easterly out towards the estuary, passing within sight of the watch station. The safety observation work undertaken by NCI Southend is therefore of value and assistance to many residents of the entire borough of Southend on Sea and to its many visitors. A group of local volunteers maintain a visual watch from the watch-station along the shoreline and out to sea, every week-end and on Bank Holidays from 0900 until 1700 hours. Two four hour shifts are worked so that volunteer watch-keepers commit to spending four hours each to cover the day. We always seek to have two watch keepers on duty at the same time in order to be able to deal with any emergencies that may arise. We are equipped with high quality binoculars and spotting telescope to be able to keep a visual watch on passing small boats and other craft in addition to keeping an eye on the many kite surfers who use the estuary and who occasionally get tangled up with Shoebury Boom, the old anti-submarine defence boom running about one and a half miles from the beach out into the middle of the River Thames. Other common problems we see are visitors to the area walking out on the sands for a mile or more not realising that the tide will cover everything up to the beach such that numerous people are in danger of becoming stranded or getting into difficulties particularly if they have young children with them. On several occasions we have spotted someone in serious difficulty at which point we contact the Coastguard who in case of need, will task the Southend lifeboat to assist. We work closely in conjunction with both HM Coastguard and the RNLI as part of the national Search and Rescue Services. NCI Southend is what is known as a “Designated Facility” which means that the Coastguard recognise us as providing high standards based upon our training and periodic inspections. We also use an electronic aid called AIS (Automatic Identification System), which enables us to identify most of the larger, commercial vessels which increasingly travel up and down the River Thames particularly to the new container terminal just beyond Canvey Island, ” London Gateway.” Training is provided for all of our volunteer watch-keepers in use of radio, identification of vessels, weather, tides, navigation and use of charts. Our volunteers come from all walks of life such as the postal service, NHS as well as former professional and amateur sailors. Age is not a limiting factor provided that volunteers are mobile and have reasonable eyes-sight with or without glasses. We positively welcome new volunteers, no previous experience is necessary as training is provided. If you or someone you know may be interested please get in touch and we can arrange for you to observe a “watch” with two of our existing watch-keepers to enable you to see if this is something you would like to do in your spare time.